With the direction our society is moving it seems that people are working longer and longer hours for more years of their lives and therefore spending more time in their cubicle, office, etc. The office has become our home away from home which should encourage us to treat it as such. If this is true for you it is important that you try to make your office space comfortable, peaceful, and encouraging. It’s easy to pick the basics for decorating your workspace: plants, pictures of family, pictures of nature, or the all important stress ball. I think that it is important to add Christian items to your office space which call you to prayer, bring you peace, help you focus, and help you handle stress more effectively. Many different items exist which are perfect for making your office space into this kind of environment. For example, prayer cards make a wonderful edition to your office space as they are simple, easy to put up, and are typically very beautiful with a simple prayer or pleasing image. If prayer cards aren’t to your liking, then maybe a simple crucifix or rosary speaks to your needs more effectively. 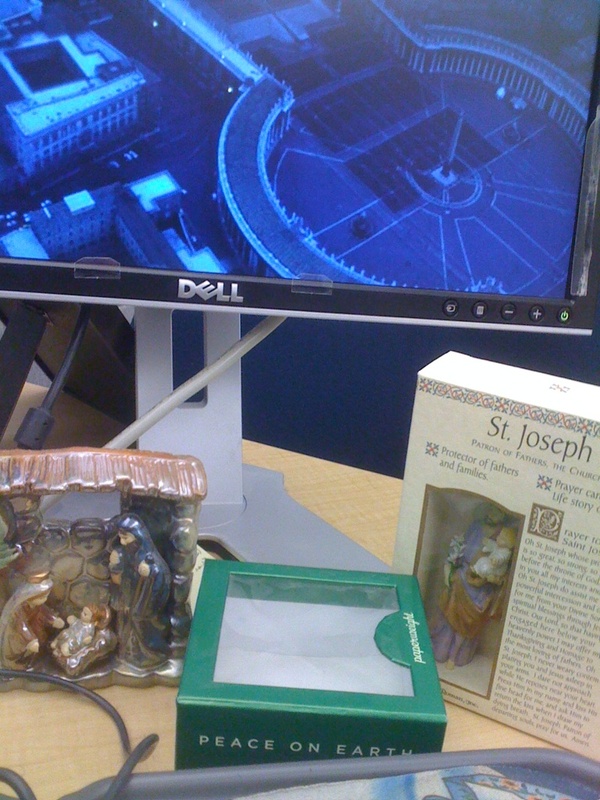 Whatever works for you, whether it is prayer cards, icons, a rosary, or a crucifix, it is important that you make your office a good holy space in which you will spend a substantial amount of time. If heavily religious articles are not welcome in your work place, perhaps a contemporary piece of Catholic art might be a better choice. You can display a Biblical or inspirational verse, your patron saint, or a Biblical scene. For the amount of time most people spend in their cubicle or office space, you might as well make it as enjoyable and pleasant as possible. Consider also that if your work environment is more peaceful and serene then perhaps the stress of work will be minimized and not come home with you. Taking a moment when times are tough to meditate with a religious devotional can help you better deal with stress, be better able to leave that stress at work, enjoy work more, and live a life filled with more peace and comfort. What do you add to your office in order to make it holy? Screen Saver! I have a picture of Bishop Rhoades and my daughter at her confirmation...they kind of keep on eye on me at work! New spin on an old-fashioned guilt-inducer? That'll make you think twice.